"The Holy Fire Reiki Master Class was unique, emotional, fabulous, spiritual, highest vibrations.It was very excited. I learned a lot of good things and tools to help me to heal my self, my family, friends etc. Still I am very excited, when I draw the Holy Fire Symbol on my hand, I feel very strong heat and powerful energy. The scanning of my body was very interesting, especially on the Crown Chakra.The Moving Meditation help me a lot also on my daily life and my practice, increasing my vibrations.I feel closer with the Divine,Universe,God, Archangels, more wise, more healthy and stronger. Namaste! With gratitude and many thanks." It's hard to put into words of my experience of the Reiki holy fire course.... I had no idea what to expect coming into it, and it was much more intense and transformational than I could ever imagine. It’s very different from the previous reiki courses I had taken. It feels like your body and mind is going through a year’s worth of reiki healing within the course of three days. There were strong moments of feeling loved and empowered and other moments of feeling like your entire being is going through turmoil. You are able to fully release the old or any negativity that is still within you. I’m so glad I got to experience this class with the grace of master Jose and all the lovely people who attended. Everyone also seemed to have different experiences in their release as well. I can honestly say that I’ve felt a difference in my life afterwards. I’m much stronger now and coming into my own as if I’m breaking through my past shell. Thank you Jose so much for sharing this with us. The new format of the Holy Fire classes opened up a completely different level of healing. Being at the Holy Fire Master level workshop provided me with a deeper level of healing experience than I have previously experienced since I began practicing. I found the workshop very enlightening as it provided some additional insights into energy that I had not previously contemplated. After utilizing the new energy, I feel that this new Holy Fire vibration of energy opens up new avenues for additional healing. I am more confident that I can accomplish more at this higher vibration. Thank you very much Jose. I recently learned about reiki, and was looking into it for someone else in my life because I thought it would really help them, but it turns out I needed this help as well. The healing sessions were very therapeutic, and I noticed the change in me right after the first session. It was like a veil or burden had been lifted, and allowed me to experience and see the truth and beauty around me that I had been missing. I felt great, and would recommend Jose to anyone. He is truly gifted and I felt comfortable with him from the first time I met him. He was very patient and listened to my problems and gave me wonderful advice that has really helped me to move forward in my life, as I was really stuck. Thank you Jose for this wonderful healing. The last few months, I’d felt that something was “off” in my life. Couldn’t put a finger on it – just didn’t feel quite balanced and that I was losing my direction and sense of joie de vivre. Jose is definitely a gifted healer. From the moment I walked into his practice on Burrard Street, I at once felt very much at ease. Jose has a very calming and healing presence and I felt an immediate sense that all was well in the universe around me. Jose took the time to listen to my story and concerns, and why I was interested in reiki. During each session with Jose, it feels like radiant coloured beams of light are emanating throughout your body. You leave the room feeling relaxed, rejuvenated and at peace. Loving these sessions so much, I’ve now signed up for a reiki class. Thank you for sharing the great gift of your healing with me Jose. I highly recommend you and reiki for those seeking clarity and peace in their lives. I found Jose seemingly by accident, but I know now that it was serendipity that led me to him as my Reiki master. Jose is gentle, kind, respectful. and intuitive, and his skills as a Reiki practitioner and teacher are extraordinary. During one of our sessions he helped me clear some very old but pretty serious negative energy I’d been carrying around with me for many years about the early deaths of my parents. It allowed me to realize how all of our life experiences — both negative and positive — can be invitations for positive change and growth. Jose is a knowledgeable and respectful teacher and his Reiki training sessions are informative, enlightening, and enjoyable. I am grateful to have received my First Degree training from Jose and look forward to continuing my Reiki journey with him as my Master. I was at a point in my life that I felt as if I couldn’t keep going. I was feeling lost, I was sad, angry, confused, and helpless regarding situations that surrounded me and consumed my thoughts. In my search for any form of purpose and peace, I was referred to Master Jose Leon for a Reiki session. I wasn’t sure what Reiki was, what to expect, or what I was getting myself into, but something inside told me to make the call. When I first met Jose, I was overwhelmed by his presence. He embodies peace, grace and love. I felt very secure and at “home.” Two days after my first Reiki session, Jose mentioned that he was teaching a level 1 Reiki workshop and mentioned that he had one space available. After being asked if I was interested, I jumped at the chance. To this day, I am not sure what propelled me to move so quickly, but I am so thankful I did. It will forever remain as being one of the most important and life-changing two days that I have ever encountered in my 32 years on this planet. Divine timing, I say! Words cannot begin to describe my gratitude for Jose and how his teachings and treatments have re-introduced peace, love, balance, confidence and love into my heart allowing me to reconnect with my beautiful spirit that had been forgotten for so many years. I started seeing Jose in August of 2012. I was looking for some guidance in my career and my true path in life. I was first made aware of Reiki through a family friend. I did some research and found Jose through the internet. I felt he was the teacher I needed to start this new journey. I made my first appointment and after my first experience with Jose my life changed. Physically, I left my first session feeling lighter, buoyant and peaceful. As i progressed in the next few sessions I felt a major change in my outlook and purpose. Within 3 months I finished my first and second level of Reiki, resigned my toxic job and have focused on my true passions. Today, I have found inner peace and live my life with more fervour. I practice Reiki to assist friends and family whom have assisted in more ways than they know. I am so grateful and blessed to have crossed paths with Jose. Over the past two years I have been incredibly pleased with Jose’s work. I first saw Jose at the time when I was facing major challenges in my personal and professional life. Jose’s healing session was the single best way to encourage lasting change in my life because it produced such a subtle yet profound shift with me. For those of us who fear change, it is the most digestible shift I have ever experienced. After each session I would find that I move through the world a little different than I did before. I’ve always felt sessions with Jose very relaxed, confident that I was in capable hands, and later feeling like a newer and more improved version of myself. I’ve had success in our sessions on energetic, physical and emotional levels with lasting results. I cannot thank you enough for your loving and selfless service. With gratitude and love. I was a mess. Stress and anxiety were playing havoc with my life and I felt like I was never going to feel “normal” again, that I was going to have to live the rest of my life this way. And then a chance meeting with someone, and perhaps an aligning of the stars, I was introduced to Jose and Reiki as a form of healing. I had not really heard much about Reiki but was willing to try a holistic approach to my anxiety as conventional medical practices had not helped. What a difference! Through Jose’s expertise as a Reiki Master, I have more energy, more peace, and more pleasure in life. But, most importantly, through Jose’s wisdom, compassion, insight, and gentle guidance, I have been able to find myself again. With Jose’s help I have been able to start an incredible path of healing that has allowed me to peel away years of, well I can only describe it as mess and junk, that prevented me from truly loving and respecting myself and from living in each blessed moment. I look forward to continuing on my path of self-healing with Jose as my loving, compassionate, intuitive and humorous guide. Jose, I truly can’t thank you enough for all that you have done for me and I thank the Gods everyday for having met you. I could not, and would not live without Reiki as part of my lifestyle. Reiki has changed my life in many, many ways, all of which are positive. First and foremost, Reiki has helped me in accepting myself and to become a much more relaxed, comfortable and confident person. All my life (59 years) I have never felt worthy. After many Reiki sessions with Master Jose, I have finally broken the “old patterns”. Now, not only do I feel very worthy, I have accepted myself, and am very proud of who I am. I am a much more confident person, which shows each and every day in my personal life as well as my professional life. Reiki has helped me to have a calmer mind, be more focused and think more clearly.I believe in Reiki so much that I have taken my Level I and II Reiki and make it a practice to perform Reiki on myself on a regular basis. AS A CLIENT AND A STUDENT OF REIKI MASTER JOSE LEON, I HAVE NOTHING BUT PRAISE! 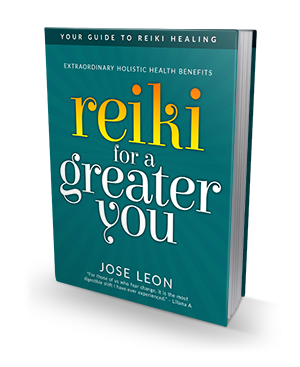 IF YOU ARE FINDING YOURSELF IN A TIME OF TRANSITION (WHATEVER THAT MAY BE FOR YOU) OR IF YOU WANT TO REALLY CONNECT TO YOUR OWN INNER GUIDANCE JOSE EMBODIES WHAT REIKI IS ALL ABOUT. HE HAS AN UNBELIEVABLE WAY OF TAPPING INTO A HIGHER KNOWLEDGE AND SPIRITUAL CONSCIOUSNESS, HIS PROFOUND UNDERSTANDING OF WHAT IT IS YOUR GOING THROUGH, AND THEN HIS ABILITY TO HELP YOU TO UNDERSTAND IT YOURSELF; QUITE SIMPLY HE AMAZES ME AND I AM SO GRATEFUL HE CAME INTO MY LIFE. I HIGHLY RECOMMEND HIM TO ANYONE WHO IS OPEN TO RECEIVING HIS GUIDANCE. In a world so focused on perfecting the self from the outside in, Jose’s teachings are an enlightening and humbling reminder that everything we truly seek lies within us.’ ‘even at a young age, I’ve always had a sense that healing was a part of everyone’s journey and that if I could be brave enough and consistent enough in facing it, I would surely evolve to appreciate the blessings and teachings of the human experience. In my few months attending reiki sessions with Jose, I have been gifted a powerful sense of self that has enabled me to heal years of pain and guilt, and has restored me to a balance that felt out-of-reach for the longest time. Jose is a wise and beautiful humanitarian, and whether you seek his care for injuries of the physical, emotional or spiritual kind, he will work selflessly to restore you to health. I was introduced to Jose Leon four years ago through a friend who has been seeing him and is also in the healing field. Jose is an amazing person and healer. He has helped me tremendously over the last four years of my life. Just recently I experienced a major challenge in my life. I felt so helpless, sad and confused. After I took a just few of Jose’s reiki treatments, I felt calm and hopeful and the fear I was carrying around with me started to disappear. It seemed like a heavy cloud was lifted from me. I have gained tremendous spiritual growth over the last few months and I know that without Jose’s reiki treatments, I would not be where I am today. He also taught me to look at certain situation from a different angle and to see the positive opportunities that lay hidden within it. Being highly intuitive and having mountains of compassion makes him a true healer. Jose always greets you with a warm smile and makes you feel at ease and at home. I feel safe with him and I know I can trust him with all my issues without being judged. His treatment room is very calming and clean. Jose is highly professional and is always on time. I really believe in my heart that he is one of the best reiki masters out there and I feel truly blessed to have found him. I highly recommend Jose to anyone. Meeting Master Jose was my first experience with Reiki. His compassion and patience helped me open to Reiki and to life in general. Jose creates a safe space and his Reiki Level 1 workshop helped me to understand Reiki more and to learn self-Reiki. Reiki has opened me to healing and set me on my healing journey. Master Jose’s treatments have been nothing short of miraculous for me. I was facing so many challenges in my life the stress level was intense. Master Jose started treating with Reiki and then I realized just how much stress and worry had taken over my life. Through the treatments I am now moving forward to my true potential. I am now on the Reiki path and with Master Jose’s guidance and teaching I am myself on the way to becoming a Reiki master. So profound are the treatments I can feel the stuff of life giving way to a more positive, more intuitive, more spiritual way of life it is amazing to me. My life is changing, such is the power of Reiki and Master Jose. I recommend to anyone if you want a true healing, you must have Master Jose work on you with Reiki sessions you will feel the energy he creates moving through your body and mind strengthening your immune system and reducing stress. I have been seeking all my life, finally I have found the teacher. Master Jose is as they say “the real deal” You can only benefit from his life’s work and wisdom. I am eternally grateful fate led me to him. Master Jose is a very powerful healer and a patient teacher. Prior to seeing Jose I was always very low on energy, drained and aggressive. After Jose introduced me to Reiki I do not see myself living my life without it. It has undoubtedly help me break my old mold and empowered me to be more confident in my personal life choices and be a stronger yet relaxed person. His treatments have also raised my energy levels and made me into a much more positive person. Master Jose also talks to me through my treatments and guides me on a path to be more spiritual and more aware of what is happening around me. If I do not understand something he is always patient, there to answer my questions. His Reiki workshops have always been a pleasure to attend and to be at. He always provides a very comfortable environment to learn Reiki. I have so far attended the Level I and II workshops and I plan to take Mastery. Reiki has been a very positive force in my life and Jose has been the best guide and catalyst. He has given me the means for that positive force and energy to be a bigger part of my life. I am blessed to have him as a teacher and I would recommend anybody who requires healing to see him. Thank you. I first met Jose in Dec 2010. I had just gone through a nasty separation from my 2nd husband. At the age of 60, I could not regain my health or happiness. I felt lost with no where to turn to. After a few months of Reiki Healing with Jose i felt like I did 40 years ago. I stopped worrying and started to laugh again. I felt at peace. I took Jose’s Workshop1 for Reiki Healing. I can heal myself and others now. I am no longer stuck. I know where I am going now. I was recommended to go to Jose when a friend saw that I wasn’t doing well. It took me a while before I made the appointment. If I knew how Jose was going to help me I would have called right after talking with me friend. After seeing Jose for the first time I felt a huge weight leave me. Jose has such a calming manner to him I can talk to him and he tells me the truth no matter how painful it can be. I always feel so much better after a session with Jose. When someone can positively affect and shift the vibration in the room without having to say anything, but just be and excude grace, that is a divine experience. A person capable of this would be an old soul who chooses to devote themselves wholeheartedly to the betterment of all. Such a person is Master Jose. The light and grace of Reiki, through the work that he does, has touched my life most profoundly. It seems that when the student is ready, the teacher will appear. And he sure has. For this, I am so full of heart-warming gratitude for Master Jose. Since I am quite sensitive to energy, it feels amazing to receive it from such a powerful conduit. Reiki “cleanses” me (spirit, mind and body) in a way that is really hard to articulate in words; it must be experienced. In a lot of ways, it is beyond the logic of the left-thinking mind/society we live in. It is also because of this, that I hope people honour themselves and have the courage explore Reiki with Master Jose. Through my personal journey, I have grown to be more sensitive energetically, clear blockages within and manifest what I truly desire, with my intuition strengthening to boot! This is because of the blessed work he does on me. The guidance he gives me is priceless, as I have gone through many lessons in a matter of months. His wisdom keeps me grounded at the centre of my being, where I can really see my true divinity. He often reflects to me the journey I’m on and provides insights that I would not have seen. We need clear, grounded, humble healers to reflect this to us, and we have been gifted one through him. I’d like to say that the leaps and bounds I’ve made is definitely a reflection on the teacher and the great work he does. Master Jose, it is my honour to learn and to receive reiki from such an amazing being. Thank you. I had been searching for the right teacher to come for a very long time, and I always seemed to be looking in the wrong places. I was thrilled when I was introduced to Jose, as I knew he was the real thing! I have always been sensitive to energy, but I didn’t know what to do with the what I was picking up. Emotions and sensations had become a big grey mess. Since I have been receiving regular healings from Master Jose, I finally feel like I understand who I am and what I am meant to do. I no longer feel like I am wading through a fog of frustration and nothingness. I am so grateful for his ability to provide a safe and comforting place to acknowledge and expel fears, past wounds and traumas. I have regained my confidence and self esteem and have found the direction I have been searching for my whole life. I have much appreciation and gratitude for Jose. He changed my life! Thank you! I have been always been curious of metaphysical and alternative medicine. I am an ex Olympic athlete. Now I am retired and do coaching … While I was pro athlete I soon realized that the physical limit are first of all mental… And behind the mental and psychologic There is an energy. I felt few time in my career …A life force all around us… I decided to found out … My intuitive sister and counselor pointed At me Jose Leon … She told that is your master… She was right …as usual. I knew it will be a life changing experience… And it just the beginning… Thank you Jose to show me who I am Thank you for your patience. I am closer to myself than ever before. It’s amazing. When I first met Jose, it was for a massage treatment. Upon our first encounter, we immediately connected. I felt a sense of calm, comforting energy, but yet strength in his aura. He seemed, to me a very spiritual person, which made sense later as I discovered I was on my own spiritual path. Jose introduced me to Reiki, which I had no knowledge of at the time. I was very open to this new experience because he was very kind and very wise. This helped me progress on my journey. Throughout our sessions, Jose has opened my life up to spirituality and how abundant this energy has been in my life. He has taught me a lot about how to embrace what is necessary and how to utilize my strengths to become who I am today. Jose has supported me through a difficult time in my life, channelling me the right direction. He has taught me to accept and empower myself with whatever challenges I am faced with and how to learn from each experience. Jose is a very powerful healer while being a very calm spirit! Since our first meeting, I have become a reiki practitioner and have been able to connect to that power that has been lingering within. His teachings and guidance have helped open up my life to become the powerful light I am today.I can’t thank you enough Jose, for all the encouragement and knowledge you have blessed me with over the years,Thank you! Before I started receiving reiki from Jose Leon, I had a problem with anxiety, drinking, and holding back. After seeing Jose each week for the past few months, I haven’t had a drop of alcohol, my anxiety is a lot better, and I’m not holding back my company out of pointless fear anymore. I can easily say that reiki with Jose has greatly improved my life. I definitely encourage everybody to see Jose for reiki. I have already taken his reiki 1 course, and I’m about to take his reiki 2 course next week. Best thing I have done! Love it! When my colleagues ask me, ” how are you today ? ” I enthusiastically respond “fantastic! ” I do not even remember feeling this good. This is the result of a handful Reiki sessions with Jose. I am also more relaxed and much less edgy or on edge. My heart has more prominent role in my interactions with people. Not only am I happy but everyone around me seems much happier too. I have met Jose numerous times for personal reiki and my level one. My experience with Jose and reiki has changed my life entirely. His skills with reading as healing energy is quite an experience and I feel more grounded, confident and enlightened after every session, not only is he an amazing reiki master he is also a great friend. ~B.E. Jose is AMAZING!!! Words cannot explain how much Jose has helped me with my spiritual and healing journey. Jose opened my heart to a whole other realm that I did not even realize existed. I have received a hand full of treatments from Jose in 2011 and I did his level 1 Reiki training, which have made a profound positive change in my life. Jose is VERY INTUITIVE and is a TRUE HEALER. I plan to do the level 2 Reiki training and continue treatment with Jose. Jose is extremely calm and very powerful. Jose always help me find the peace within. I have worked with many healers, but Jose’s power of purification combined with his altruism is unique. I am a Reiki master myself, but I can’t resist going back toJose every other week. I’d like to thank Jose for introducing me to Reiki. It has guided me spiritually and emotionally. I am now looking forward to taking a level 2 reiki workshops. “thank-you” Jose for enhancing my life journey.